A prosthetic hand is about more than just improving the wearer’s physical capabilities. It’s also about improving their self-confidence. 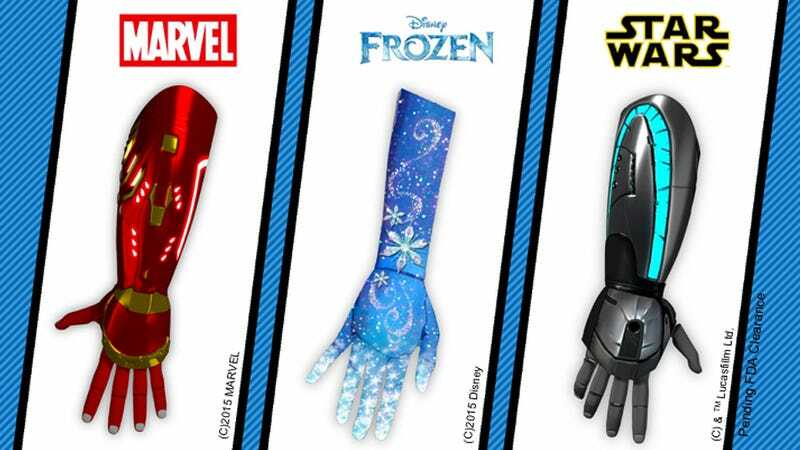 So Open Bionics, makers of low-cost but highly capable prosthetic robotic hands, have teamed up with Disney to realize some very cool designs. Kids can be bullied for something as innocuous as wearing the wrong shirt; imagine what life is like for a child missing a limb. So not only has Open Bionics designed what it’s claiming is the world’s smallest bionic hand, the company has also joined forces with Disney to create three versions featuring designs and glowing LED features inspired by Iron Man, Frozen, and Star Wars. Led by Joel Gibbard, who’s best known for the open source 3D-printable Open Hand Project, Open Bionics is part of Techstars’ Disney Accelerator program. That means they have royalty-free access to these three properties, and worked with Lucasfilm’s ILMxLAB on the Star Wars hand. The company’s goal is to produce a commercially viable prosthetic using the same 3D-printing production techniques as the open source version, to keep the cost highly affordable. But with an increased focus on aesthetics and design so the prosthetics are as much a fashion accessory the wearer can be proud of, as they are a boost to their capabilities and an improvement of every day life.